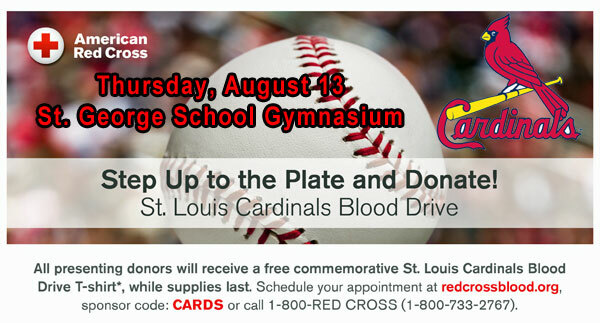 Columbia, MO — Hermann Area District Hospital, St. George School, KWWR, the St. Louis Cardinals and the American Red Cross encourage fans to step up to the plate and donate blood to help patients in need on August 13th at the St. George School Gymnasium, 133 W. 4th St., Hermann. Everyone who attempts to donate blood at the Hermann Cardinals Blood Drive will receive a specially designed Cardinals T-shirt, while supplies last. Thursday, August 13, 2015 from 1:00-6:00 p.m.
St. George School Gymnasium, 133 W. 4th St., Hermann. For the past decade, the Cardinals have hosted Red Cross blood drives in an effort to help save lives. Blood donated at the St. Louis Cardinals Blood Drive could help many patients in need, including accident victims, cancer patients and those undergoing surgery.